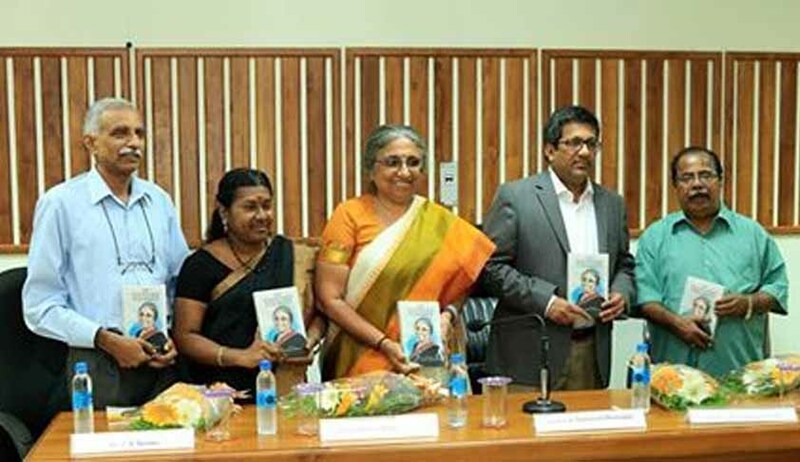 The Inter University Centre for IPR Studies, CUSAT, Kochi, hosted the launch of 'Of Vineyard Equality' by Justice Prabha Sridevan on Sunday. A compilation of her articles and speeches, the book articulates her take on various facets of law related to intellectual property rights, human rights in general and women’s rights in particular. The book is an anthology of her speeches and articles on Human rights, women rights and IPR providing a perspective and understanding emanating from experience and awareness gathered over a lifetime of dedicated service to judiciary. Giving a glimpse of the issued addressed in the book, Justice Prabha Sridevan shared her ideas on justice and said that her book is about ‘laws that thwart justice’. She called justice an ‘elusive concept’ and expressed that the meaning of justice changes according to the laws in different cases depending upon its nature. The title of the book Of Vineyard Equality is inspired by the thought of Justice Albie Sachs, a former judge of the Constitutional Court of South Africa, who, according to her, is one of the greatest judges to uphold fraternity, equality and justice. The keynote address was delivered by Justice Muhamed Mustaque, judge, High Court of Kerala. In his speech, Justice Mustaque emphasised that actual justice does not prevail in a courtroom or in a judge’s judgment, but in the society. He said people have the responsibility to treat fellow beings without discrimination and understand the true meaning of equality. He reinforced the idea that people must learn that true justice comes from within rather than counting on courts and judges to provide that. Dr. PS Seema, Director, School of Legal Studies, CUSAT, delivered a special address on the occasion. She deliberated on the legal explanation of equality and put forth several landmark cases wherein provisions of constitution on equality were questioned. She explained how the clash between personal laws and fundamental laws were dealt with in different cases and justice was rendered by varied interpretation of these laws. The first copy of the book was presented by Justice Muhamed Mustaque to Dr. KN Chandrasekharan Pillai, former director National Judicial Academy, former director Indian Law Institute, former director and dean, faculty of CUSAT, and former member Law Commission of India. With a career studded with milestones and passing of several landmark judgements, Justice Prabha Devi is one of the three Indians listed among the 50 most influential people in IPR, 2014-15, by International Journal Managing Intellectual Property. Appointed as the fifth female judge in the Madras High Court, Justice Prabha has been known to have asserted in favour of women’s rights in many of her judgments during her significant 10-year tenure. Post retirement, she was appointed as the chairman, intellectual property appellate board, from 2011 to 2013. She has also headed the thinktank that is meant to draft the country’s IPR policy. She writes regularly in English and Tamil on issues of ‘Law and Life’. She has also translated a collection of short stories by R Choodamani titled Seeing In The Dark. In a blurb by Justice Ruma Pal on the book cover, she writes that Justice Sridevan’s thought-provoking opinions lucidly and almost conversationally expressed, engages the reader whether from a legal or non-legal background, to participate in her passionate commitment to the delivery of justice particularly on human rights issues. The event ended with a vote of thanks by Raghul Sudeesh, founder of LexLab publications and Executive Editor at The Kochi Post, an online news portal.